When selecting an acupuncturist you’ll want to ensure your practitioner has graduated from a master’s level, ACAOM-accredited program and can demonstrate they have the proper state certifications. Beyond that, a more contentious debate is whether this acupuncturist should have a focus on fertility and whether that should be reflected in an ABORM accreditation. At the moment, there is little data to say one way or another. Patients should confirm that their acupuncturist has graduated from a master’s program an at ACAOM-accredited school. 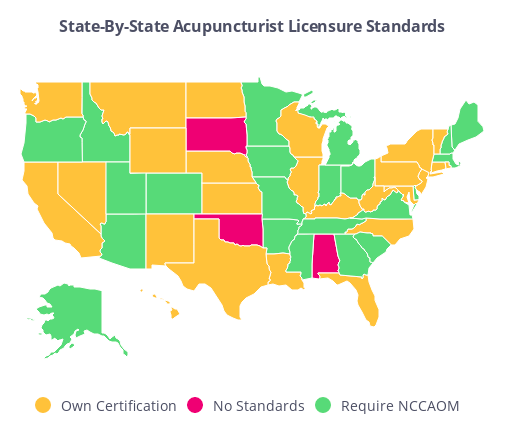 Next, you will want to ensure the acupuncturist is NCCAOM-accredited, which means they have passed their boards and continually take medical education courses to stay current on best practices. Ideally, your acupuncturist has done an additional year of schooling, and taken more extensive NCCAOM testing to be a “Diplomate of Oriental Medicine” which marries the “Diplomate of Acupuncture” and “Diplomate of Herbology” disciplines. Many U.S. states require acupuncturists pass certain examinations to practice. For many, those include NCCAOM tests but not all states require this and so the minimum standards for being state licensed can vary. Finally, some states have hardly any standards or minimum requirements whatsoever, in which case patients likely need to be all the more discerning. There is no data available that acupuncturists with a specialization in fertility treatment deliver better outcomes than generalists. That said, we believe it makes sense to find a practitioner who is experienced treating fertility patients, is familiar with the underlying issues and knowledgeable about what western fertility treatments patients will undergo. There are circumstances, especially when it comes to the use of herbs, when an acupuncturist and a fertility doctor need to be familiar with what the other is doing. When choosing an acupuncture provider, we suggest asking about their level of training, experience in treating infertility patients and ongoing educational activities. Consider working with a provider who has at least 3 - 5 years of clinical experience in the field of infertility. The American Board of Oriental Reproductive Medicine (ABORM) is an independent organization formed recently (in 2007). It requires prospective members to complete post-graduate training specifically in reproductive medicine and be licensed for a minimum of at least 2 years. The applicant must also pass a certification examination. We consider ABORM Fellowship to be an indicator that an acupuncturist has a focus on fertility but there are a significant number of superb fertility acupuncturists who do not belong to ABORM. A course of 10 treatments will cost the patient 5 - 15 hours of treatment/commute time. Finding an acupuncture that is close and accessible should be a priority. Additionally, you should look to work with a practitioner who can treat you at your clinic on the day of retrieval or transfer. It may be helpful if your fertility doctor and acupuncturist have worked together before. While we believe it’s rare for the reproductive endocrinologist and acupuncturist to communicate, should that be necessary (e.g. for instance around topics like diet or herb use) it will save time if there is already a trusting dialogue in place. One place to start your search is at your clinic. Acupuncture is now a common treatment supplement in fertility practices and so your doctor and their staff will likely work with local acupuncturists. Many practices have a trusted group of acupuncturists whom they've likely vetted. Ensure your clinician graduated from an ACAOM accredited program. Ensure they have NCCAOM accreditation (or proper state licensure) with a bonus if they are “Diplomate of Oriental Medicine” for prescribing herbs. Preference those acupuncturists with experience treating fertility patients. Membership in ABORM is one potential indicator of this. Ensure your acupuncturist can treat you at your clinic on the day of transfer.